Posted On Sun, 14 Aug 2005 18:01:00 +0000. Filed in family. By Vaibhav Bhandari. IMG_0086 Originally uploaded by vaidehib. Yep! i’m on the east coast helping out Vaidehi get settled in to life as a graduate student! 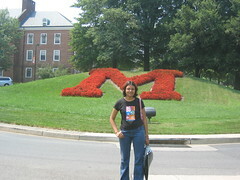 In this picture, she is at her alma mater showcasing the big-M. This reminds me of my days as a graduate student from India trotting the soils (eventually spoils) of US of A. I have been trying to assist her in getting all tucked up for the semester bash but hey! I’m also trying not to feed her too much!! After all self-reliance works best, but yep as a younger sibling i do pamper her a little bit :). Indulgences and bonds!! !